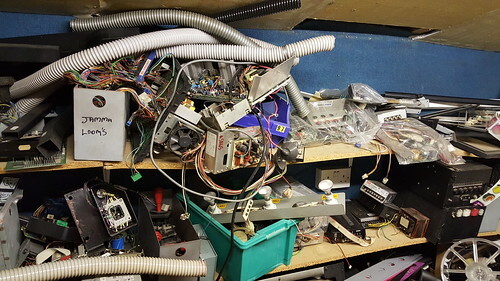 I recently visited an Arcade Operator who has been in the industry for twenty five years. 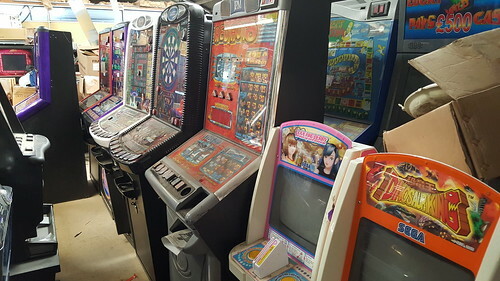 Nowadays the Op deals in fruit machines and vending machines, pool tables and jukeboxes. 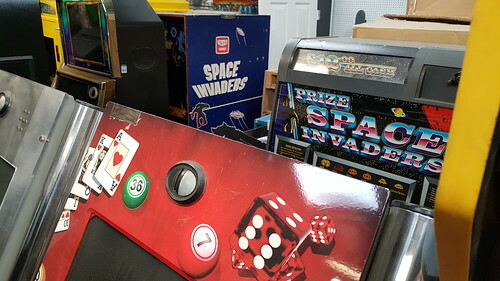 Video games have become a smaller part of the business, and sadly he admits that a lot of arcade gear had been scrapped over the years. 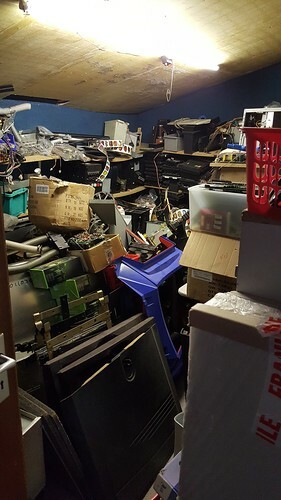 The Op told me he had lost track of his inventory. 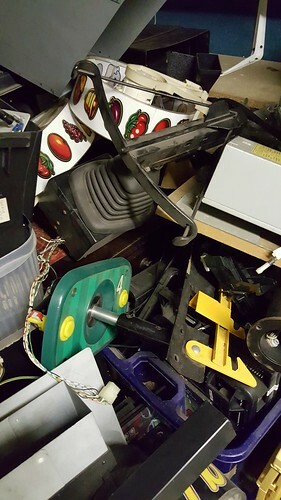 He allowed me to have a rummage round the premises and stockpile items I was interested in buying. 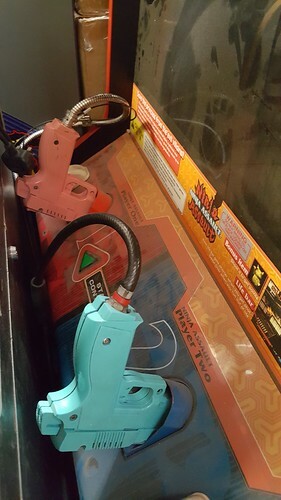 There were some nice items to be found. 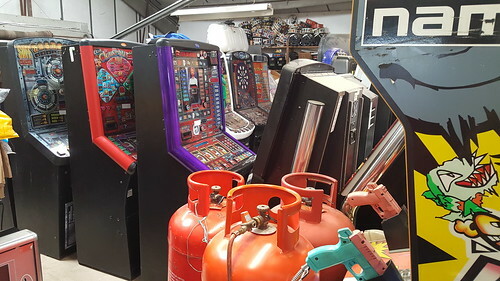 In this room there were a lot of fruit machines with a few arcade cabs amongst them. 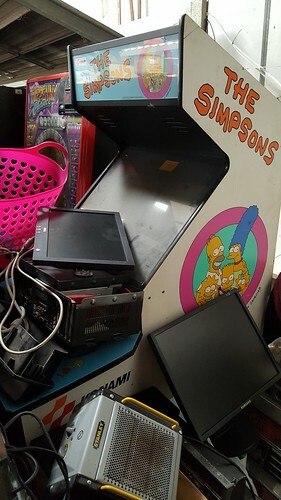 A partially buried Simpsons cab. 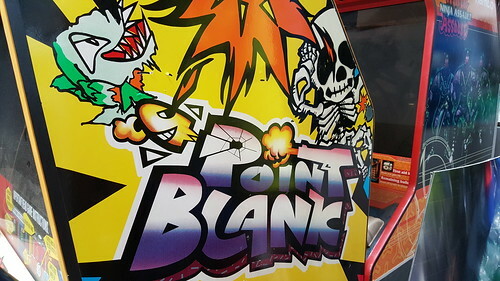 Point Blank and Ninja Assault, two great Namco shooting games. 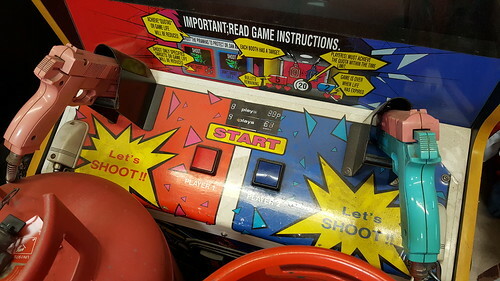 A Mr. & Mrs. Pac-Man pinball backbox. A Dinosaur King and a Love and Berry cab. I think it’s the first time I’ve seen the latter. 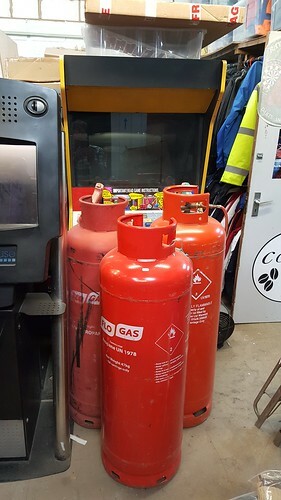 The Op mentioned that these may go back on site. 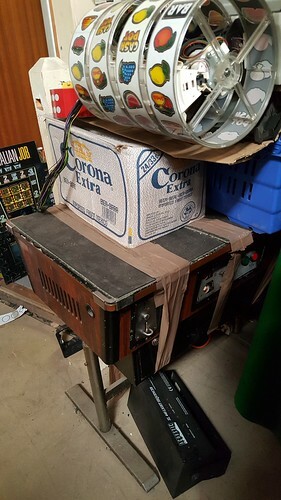 A generic cocktail cabinet. Unfortunately it looked pretty beat-up. 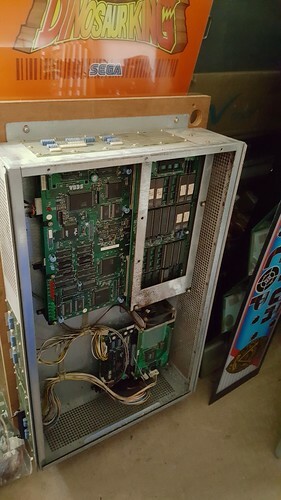 A classic Taito Space Invaders. 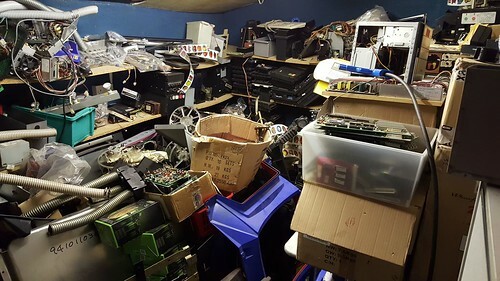 I spent most of my time rummaging in this room. 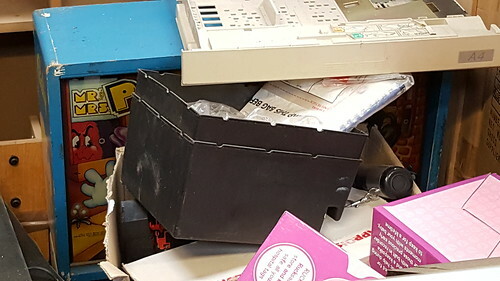 Items had to be relocated to move round the room, and getting gear out was a bit of a mission! 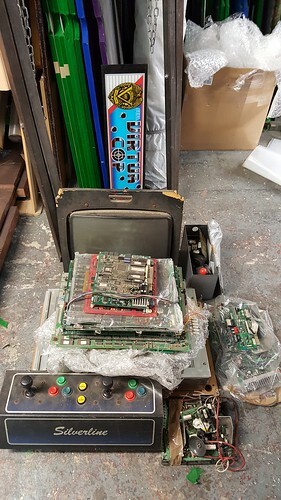 It was mostly fruit machine parts, but I did manage to dig out some nice items. 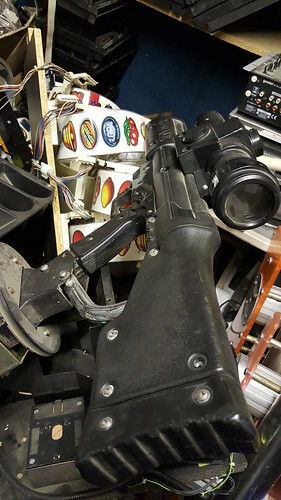 There was a full arsenal with guns, sniper rifles and even a crossbow! 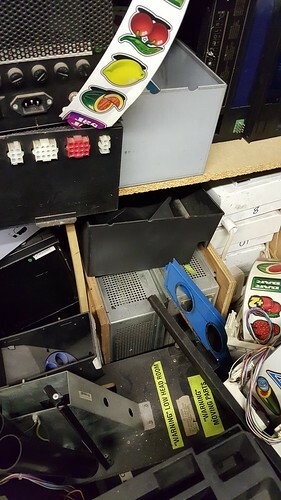 These Sega cages were well buried, but I was determined to dig them out! 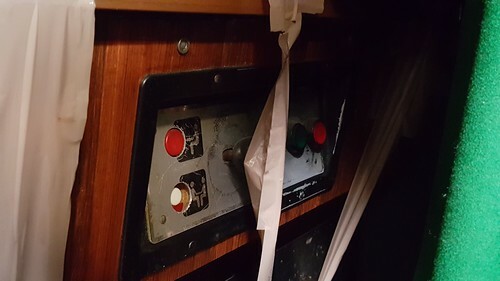 The Op thought they were Sega Rally and Touring Cars, but wasn’t sure. 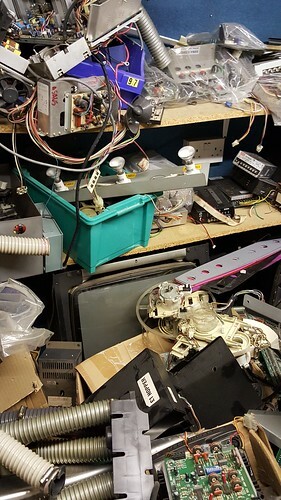 There were all sorts of random items on the shelves, including monitor chassis, joysticks, buttons, looms, power supplies and Sega Model 1 parts. 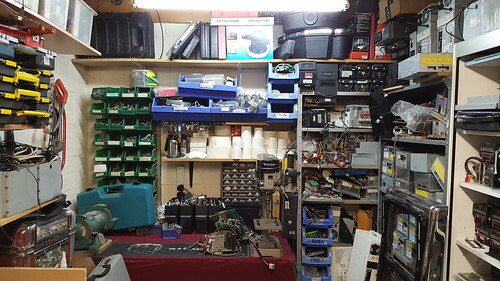 The workshop area had shelving units full of spares. 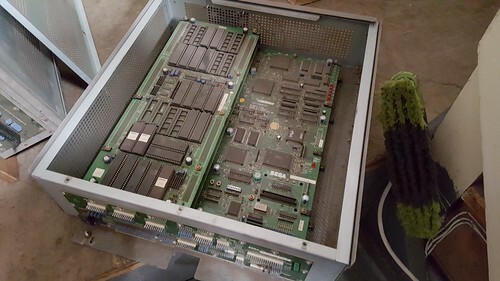 On one shelf I found a stack of PCB boards and some monitor chassis. 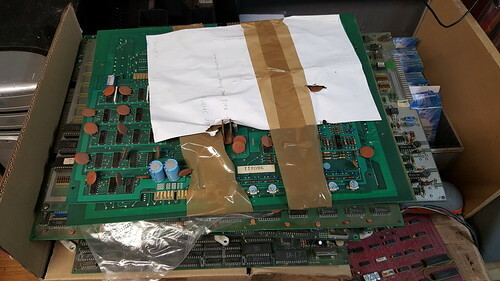 The PCB’s include Asteroids, Liquid Kids, Space Invaders and Wardner, as well as some others I haven’t yet identified. Quite a random selection to find on a shelf. 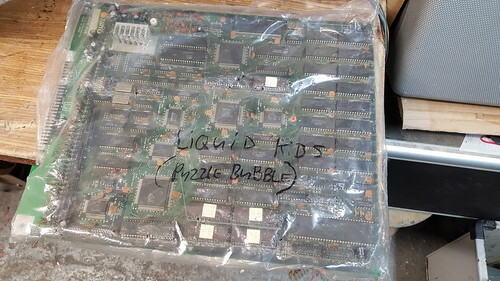 I don’t recall seeing either Liquid Kids or Wardner back in the day. 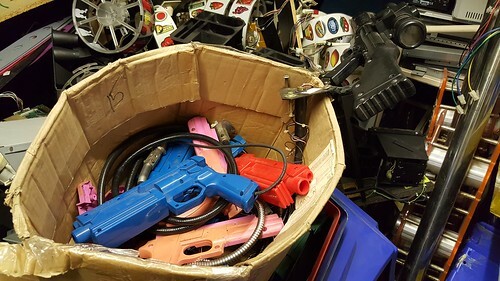 They also had pool tables, crane machines and a Terminator Salvation. My pile of pick ups. 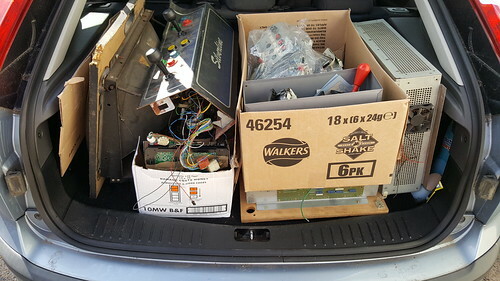 After a bit of Tetrising I managed to fit it all in the boot. 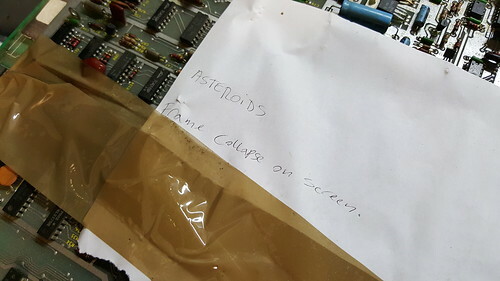 The Asteroids board had a hand written note attached. 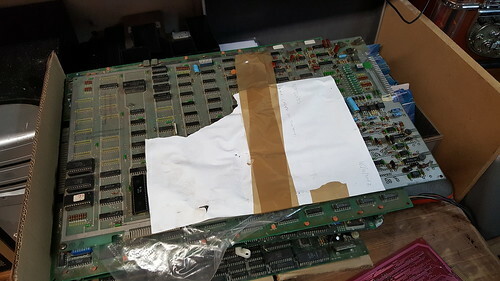 I sent the board off to RetroClinic to have the board repaired and refurbished. 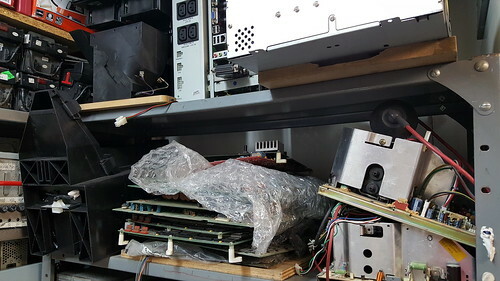 Here is a test video which explains what was done. 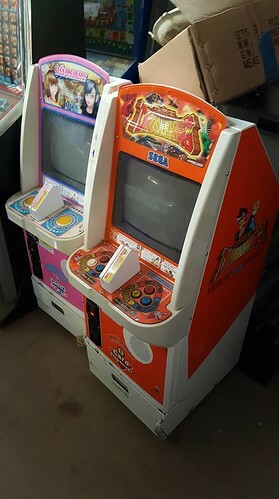 These turned out to be Sega Rally and Virtua Cop. 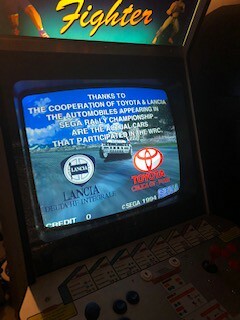 The Sega Rally proved to be fully working, and the Virtua Cop required a new CPU. 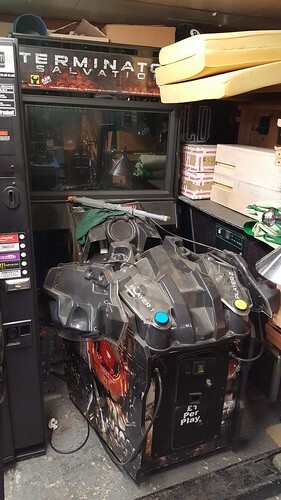 Sega Rally being tested on a Virtua Fighter cab.